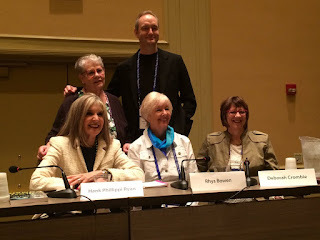 RHYS: Four of us Reds are at Bouchercon and three of us were lucky enough to be on the same panel. And what fun it was: Horror stories from the road. All the things that can and do go wrong on book tours. Hank told a tale about staying at a house with too friendly birds that landed on her head. Debs told of coming down with the flu when she was having the most elaborate tour of her life in Germany. I told about doing an event at a naturist resort (okay, nudist colony). And we all had hotel horror stories. Fellow panelist Andrew Grant told of having his luggage lost when he was speaking at a tented camp in the Sahara desert. And one of the highlights of the convention was the parade down Canal Street, complete with band, floats, stilt walkers AND RAIN! 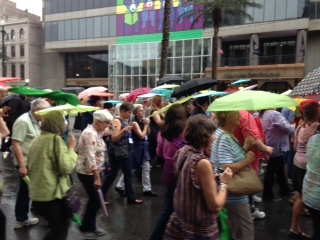 But everyone was in good humor getting wet. 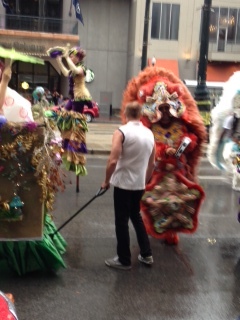 Poor Harlan Coben, one of the guests of honor in a float tried to hold a paper umbrella above his head. But one thing is sure: we're all eating, drinking, laughing and having fun. Great convention. That was such a fun panel! The four of us here are getting together tonight but we miss Julia, Hallie, and Lucy. Thanks for the pix, Rhys! So great to read the updates and see the pictures; thank you! It sounds like everyone's having a great time! Thanks for the pictures! Hope we hear more about your time there! I hope that rain cooled things off a bit, at least. Had any beignets yet? That is the perfect panel for you seasoned red travelers! It sounds like a fabulous weekend and we are at home are moping and groaning that we weren't smart enough to come. You guys were great!!! I was there with some friends. It was a very enjoyable panel -- loved all your stories. And I enjoyed Susan's panel. This is my first Bouchercon and I'm already planning for next year in Toronto. I have had the best time! And a couple of real fangirl moments. And now to figure out how to lug all the books on the plane tomorrow. With all the traveling you folks do, it itsn’t surprising you have horror stories. 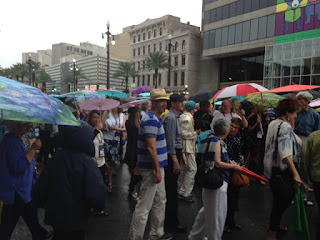 What a brilliant idea to have Bucheron in New Orleans, it’s such a fabulous city!! Now I’m sure none of you will be overindulging, but in case you know anyone who might, I have a resource for you: NOLADOC.com. When my husband and I were there last December, I had an encounter with what I thought was a friendly street cat. It wasn’t and I needed some first aid, so Ron looked on Yelp and found ND. The nicest, most professional doc came to our hotel room, and while he was treating me we chatted about the various services he offered. Turns out the most popular, by far, is the IV Therapy. People actually make appointments for ND to come to their hotel suites on the mornings after events (mostly bachelor parties) and ND hangs up six or eight or however many IV bags are necessary. 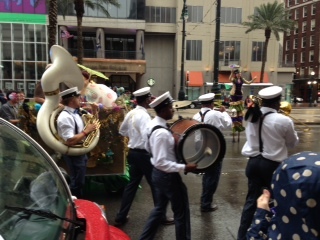 It’s such a popular service that NOLADOC isn’t the only provider in town. Where was this when I was drinking?! Thank you so much for sharing your panel with us. Traveling snafus? That will be a panel I would love to hear. After hearing about Bouchercon from y'all I have decided to go in 2018. I am counting the days (719 as of today) until St. Pete. Bouchercon. Sorry about the rain, did it turn into a steam bath? 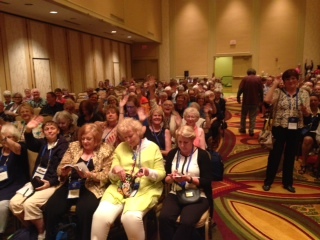 Yes, it has been a great Bouchercon. So much to see, do, eat and experience. But...I have only been able to find and talk to Hank in person. I have not seen you Rhys, nor Deborah or Susan! That is one thing I don't like about Bouchercon...it's just too big! I am not staying at the conference hotel, so I miss going to the 41st floor or lobby bar. Still have a chance to see you in person Sunday morning, I guess! Thank you for sharing these photos.